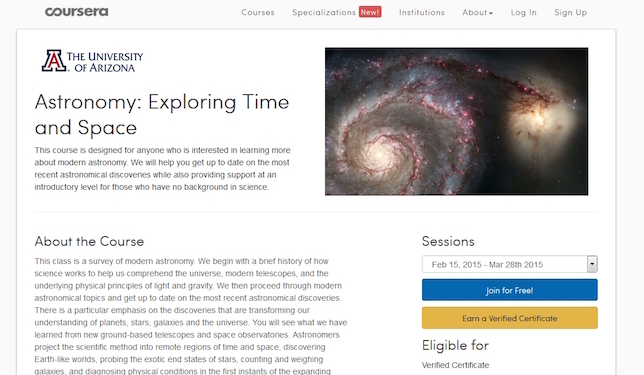 A professor with a popular Udemy-hosted MOOC is trying out his astronomy course on Coursera next, with the hope of increasing completion rates. It'll be the first massive open online course offering on that platform from the University of Arizona. Chris Impey, an instructor at that institution, has run multiple renditions of "Astronomy - State of the Art," on the Udemy platform over the last two years. The seven-week course, which uses video lectures, PowerPoint slides, discussion and live questions and answers with U Arizona faculty and students, has drawn a total registration of nearly 24,000 students. 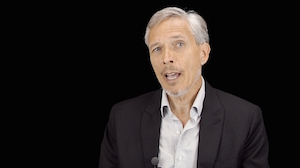 Now Impey is launching "Astronomy: Exploring Time and Space," on Coursera in a slightly shorter form — six weeks — and with additional video content. Both courses use a free online textbook written primarily by Impey and available on his Teach Astronomy site. The new class is the university's first with Coursera. Impey predicted that about 11,000 people will enroll for the new course, which launches Feb. 15. In an interview on the university Web site Impey said he had first approached Coursera in April 2012, the same year the company was launched, hoping to get his institution to join the program in its early days. U Arizona was finally able to begin negotiations with Coursera in 2013; almost two years later a deal was struck. During that time Impey shot additional video for his program and developed new online quizzes, as well as "outside projects" and "writing activities" for participants to do in order to earn a completion certificate. "We'll be using live sessions, the course discussion threads and social media — Facebook, Twitter — to keep an active presence in the course," Impey said. Written work will be "peer reviewed." He said he anticipates publishing research on aspects of course design that prove to "facilitate greater engagement and higher completion rates." Eventually, he added, he hopes to use what he learns from the Coursera experiment to "transition" the program to a "fully featured online course that could eventually be taken for a fee, with transferable college credit earned."